1. Heat grill. Trim mushroom stalks level. Brush cap sides of each mushroom with oil. Grill, cap side down, for 3 minutes. Turn over mushrooms, brush gills with remaining oil and grill for a further 2 minutes. 2. Place tomato slices on top of mushrooms and grill for 3 minutes. 3. Meanwhile, poach eggs and toast soda farls. 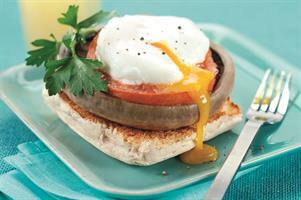 To assemble, put a toasted soda farl on each plate, then a mushroom, tomato slice, and top with a poached egg.